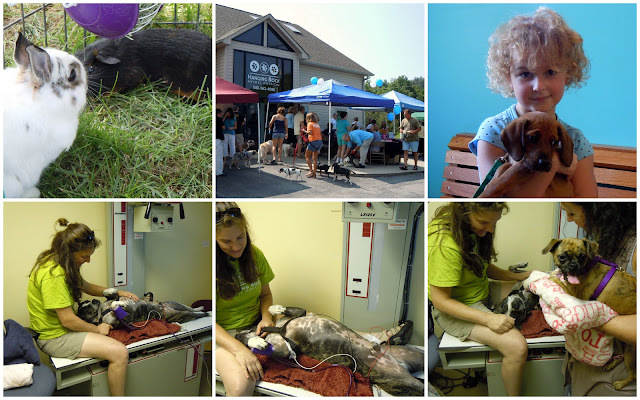 We took Tallulah over to Customer Appreciation Day at our Vet Clinic Hanging Rock Animal Hospital. They do an amazing job with their open houses. We got to see all the staff's pets and exotic animals. We also toured all the surgery and x-ray rooms. The dog laying on the x-ray table laid there for hours (just to have his belly rubbed by everyone) so his human mommy could show us how things are done at the clinic. He was a sweet boy. His mommy says he loves to play with little dogs. Look at he last photo where he is checking Tallulah out (I am rubbing his belly in that photo although you can't see my hand). His belly felt like velvet...such a good boy! Tallulah did great. She was shaking when we first arrived and then she settled down. It was a good time for everyone. Thank you Hanging Rock for taking care of all of our babies!